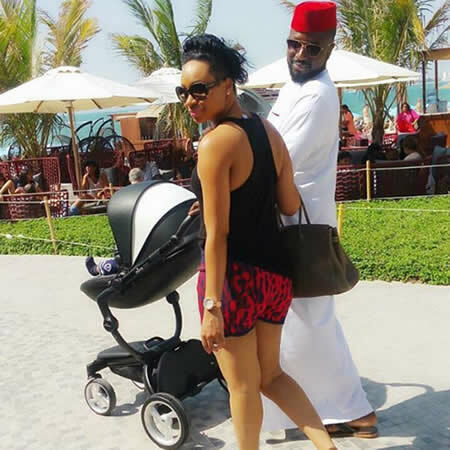 Pokello and Elikem’s child is cruising in a latest, elegant and compact top-of-the-range pram. With a leather-look flair, the stroller, a Mima Xari Argento 2016 edition valued at $1,424 was bought by Wicknell Chivayo who recently gave comedian Baba Tencen R100,000 for making him laugh. The pram purchased a few weeks ago was the young businessman’s gift to congratulate the stylish couple for their first born child. The Kumordzies who have managed to keep their young one from the limelight yesterday posted an image of them strolling with the baby. “Thank you Uncle B.I.G (Sir Wicknell) for baby’s top of the range Mima Kids wheels,” wrote Pokello on her Instagram account. She however said their baby had millionaire uncles and needed no new friends. According to the Mima website the pram is the perfect tone for parents wishing to stand out from the crowd, adding an extra sense of futuristic luxury. Xari is a unique, elegant and compact stroller that offers a comfortable and accommodating ride for both parent and baby,” it says. Wicknell, a close friend of Pokello — the Queen of Swagger — has been supportive from when Pokello was in the Big Brother Africa House. He from time to time drives to her Addicted to Shoes shop to spend time with her and Elikem. Another former BBA housemate whom Wicknell has close relations with is Maneta Mazanhi whom he bought a VW vehicle worth $10,000 three years ago.